There is a completely updated article which you can view here. I've included the original article to show how Hootsuite has changed. Hootsuite is one of the most popular and comprehensive social media tools out there. Yes, there are others such as TweetDeck and SproutSocial, but Hootsuite is considered by many as the "crème de la crème" of the Social Media Tools World. I have used it for many years and I still occasionally recommend for my clients. HootSuite is a service referred to as a "Social Media Management Tool". A Social Media Management System or Tool (SMMS/SMMT) can help you manage your many social channels by monitoring, posting and delegating tasks within a team. HootSuite was launched back in 2008 by Ryan Holmes through his digital services agency, Invoke Media. Originally, HootSuite integrated with Twitter only and was called BrightKit . In the following year, HootSuite launched a competition to help decide on a new name and HootSuite was chosen from the short list. Since then, HootSuite has grown its success, now having over 8 million users and employing nearly 400 people from over 175 countries. The head office is in Vancouver, Canada. If you manage your business’ social networks, it’s highly likely that you will have heard of HootSuite and may already be using it. Back in 2012, HootSuite came top in a list of social media management tools in a survey from monitoring tool Pingdom. According to the survey, over 20% of companies used HootSuite to manage their social media empires. TweetDeck was second and SocialEngage third. There are lots of great things about Hootsuite, but this article aims to talk about the reasons why you might not want to use it! The title of this post may sound a little provocative but aim to be constructive in my criticism. Hootsuite will be the right product for a lot of people- maybe even you. If so, please let me know why in the comments below. As I said, I've used Hootsuite for many years but I use it very rarely, this is because of some big issues that I have encountered. These are deal breakers for me and they may be for some other people. I'd be really interested in your thoughts, so please let me know in the comments. To get a more balanced view, you should also have a read of my more recent post entitled 7 Reasons why you SHOULD use Hootsuite. The issues affect mainly small businesses and individuals and concern cost, reports, url shorteners and their team members option. Although Hootsuite has a free option, and the pro option isn't exactly expensive there are some very expensive parts to Hootsuite which you may need. When I originally wrote this article Hootsuite Pro cost $5.99 per month, then it increased to $9.99 (or effectively $8.99 per month if you pay yearly). It's now $14.99 per month (or effectively $9.99 per month if you pay yearly). Also, from May 2013 Hootsuite started to offer prices in different currencies and discounts for paying yearly. If you are outside the US it will likely be more expensive for you. Hootsuite has gone out of their way to produce some helpful analytics reports. These go into great detail how your social networks are doing. 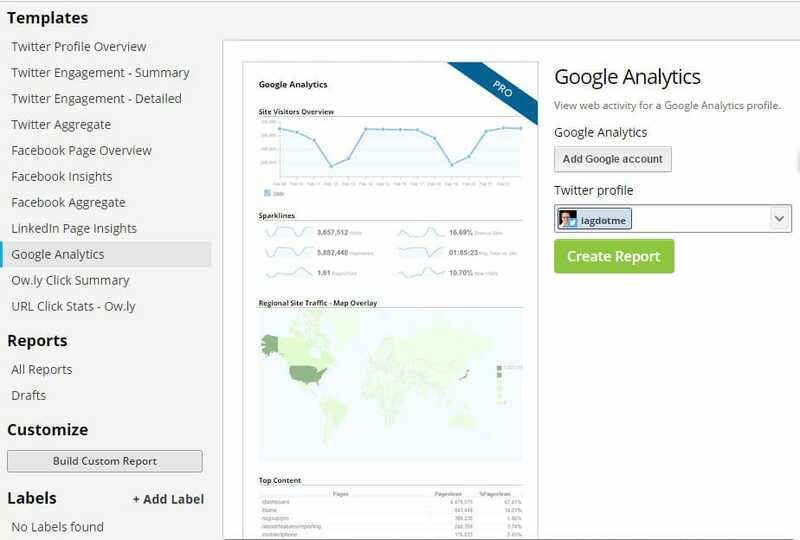 You get up to 2 free reports with the free version of Hootsuite. This is where it gets complicated. You buy reports using points. Assuming you are on the Pro plan, you get 50 points to use every month. There are some free reports as I mentioned above, but most reports are 45 points which will cost you $50 each time (or $45 if you pay yearly). If you are serious about monitoring your social media performance then this is simply not going to be enough. Yes, there are free reports like the ow.ly one (more on this later) but the others are $50 per report which is a lot for an individual or small business to swallow. The Google Analytics integration is fairly helpful and the Facebook report is a massive improvement on what Facebook gives you. The other consideration is that because Hootsuite uses its own URL shortener (more on that in a bit) it will only track click-throughs on links made via Hootsuite. If you use another social media management tool such as Buffer or SproutSocial, Hootsuite won't track links made from these tools. Of course, where would we be without URL shorteners? They started as a result of people wanting to add links to their Tweets without using up as much space. Later on, URL shortener providers offered tracking services, as they also had the advantage of tracking how many clicks were made on the link (and tracking information of the person who clicked the linked link like location and what browser they were using). Hootsuite has their own URL shorteners- ow.ly and ht.ly. That's fair enough, but you are forced to use them (unless you add your own custom URL shortener- more of that in a bit). As well as broadcasting to everyone that you are using Hootsuite (which, to be fair, happens with any non-custom URL shortener) you can only track any click-throughs that have been added from within Hootsuite. As I mentioned above, this is a real problem, as if like many, you use other services such as Buffer, SocialOomph or even TweetDeck, then you can't track the links you've added here. The Hootsuite reports that you've paid for won't give you the whole story. If you use other analytics services such as SumAll, bit.ly or Buffer then they won't show the click-throughs from the Hootsuite links. You could of course monitor reports from each, but that's no easy task. Perhaps, that's what Hootsuite want. They want to lock you in- they don't want you to use other services. For some, this isn't a big issue. For the big companies out there, offering customer services via Twitter, Hootsuite will be the best option- they don't need to use Buffer or Twit Pic. However, if you use multiple services on your Twitter account then you are out of luck. Finally, although only a temporary blip, there was an issue when Facebook blocked all ow.ly URLs. Hopefully, that won't happen again. This isn't going to put everyone off, but if you'd like a vanity or custom url shortener with Hootsuite you are in for a shock. I use a custom url shortener for the links I share on my social networks- to.iag.me for this blog and select.social for my business web site. This personalises my links and makes them more "clickable" and more professional. I use bit.ly for this, which allows me to add a custom url for free. Of course you have to pay for the domain, but domains cost very little these days. I've written a detailed article on why custom short domains are so useful- 8 Steps to Build Brand Awareness with Short Domains. If you want to use a custom url shortener within Hootsuite (or an ow.ly custom vanity URL as Hootsuite call it) then it's $49.99. That doesn't sound so bad until you realise that this is the cost per month! That means using a custom url shortener will cost you $588.88 per year on top of the cost of the domain! You get a slight discount if you pay this in one big chunk per year- $539.88. This is madness, especially since when you consider you are still locked into only using Hootsuite's reports. According to Lauren Lawton Perfors in the comments below the vanity url shorteners can only be used in the browser version of Hootsuite- not the mobile apps. So although you are paying over $500 per year you can't use them on mobile. Also you can only use this vanity url within Hootsuite- you won't be able to use it on other apps such as Buffer, SproutSocial, OktoPost etc. I've spoken to various people within Hootsuite and although bit.ly integration was discussed internally, it was abandoned. It obviously doesn't make business sense for them to do so. It's a big shame. If Hootsuite did integrate bit.ly, I would be one of their biggest advocates! If you are posting or sharing a link to your Facebook page, ones with photos and a summary are far more likely to be clicked than ones with just a short text status. When you post a single update or use the standard scheduler in Hootsuite, it does post the thumbnail and summary. It gets this from the open graph tags on the web page or tries to have a good guess. However, if you use the bulk scheduler (uploading from a CSV file) or use the RSS feature (posting directly from an RSS feed) you are stuck. Facebook is only going to get the text in a Tweet-like status (see the screenshot on the left). I did contact Hootsuite about this, and to be fair they were quick in responding "Yes that is correct if you schedule a post you can choose the thumbnail and it will post. However this is not a feature yet with RSS feeds and Bulk schedule, we invite you to submit this idea to our feedback forum here: http://feedback.hootsuite.com". Hootsuite Help also replied to a Tweet saying that it probably wouldn't be added in the future due to "logistical reasons". When posting new content to Facebook via Hootsuite, those posts do not track the, likes, shares, and comments that you received in Facebook's Insights analytical data for that post. The likes, comments and share do exist when viewing from the front end Wall and Feeds, but the "credit" for getting them is not recorded in any way by Insights. #6 Lower Facebook Reach & Engagement? Update (April 2016) - Facebook has never publicly announced that using a 3rd party tool affects the EgdeRank algorithm. Recently there has been quite a bit of research into this and I decided to update this section. Over the years, some users have suspected that using a 3rd party app to post to Facebook has resulted in their post reaching fewer people. Facebook uses an algorithm to decide the order of posts in each user's home stream. If you never engage with a friend or page's posts, their EdgeRank score will drop and Facebook will stop displaying their posts to you. Facebook uses a number of factors in their algorithm, and it is possible that they take into account whether or not you have used a 3rd party app to post the post. However, it is a controversial topic! Posting with a 3rd party tool results in 89.5% less engagement than directly posting to Facebook. That's a substantial drop in engagement! Mari Smith's article and infographic caused quite a storm, particularly from 3rd party tool vendors such as Buffer and Postplanner who were quick to disagree with the claims. Mari Smith then added some clarification to the bottom of her article which I agree with. The analysis from Buzzsumo found that there was 89.5 less engagement. That does not mean 3rd party apps were getting penalised. It could mean that the posts were getting less engagement because the posts looked automated. If you use a 3rd party app to post to Facebook, you do need to make sure you are creating it specifically for your Facebook audience. It is easier to think about your audience when you post natively on Facebook, so this may account for lower than normal engagement scores when using 3rd party apps. Buffer's response to Buzzsumo's analysis is worth reading. We'll never know whether or not Facebook devalues posts from 3rd party apps. However, make your own mind up after reading the above! The team facility is one of Hootsuite's killer features. It allows multiple members of a social media team to access multiple social media channels without needing to know the password for each one. This is very important for a security point of view and is why so many big companies use Hootsuite. If you use Twitter for customer service, being able to delegate tasks among your team members is going to be integral to your way of working. The Hootsuite plans that support teams should be affordable by the big businesses that work this way. For smaller businesses, however, Hootsuite is going to be expensive if they want their team members to use it. The Hootsuite plans that support teams should be affordable by the big businesses that work this way. For smaller businesses, however, Hootsuite is going to be expensive if they want their team members to use it. Towards the end of 2016, Hootsuite changed their pricing plans. Unfortunately, the pro plan no longer supports teams of users. If you need this, you'll have to upgrade to their Team Plan which allows up to 3 users for $34.99/user/month. If you need more than 3 users, you'll need to upgrade to their business plan which costs $7,000 per year! Ouch! For more information on these prices and how they compare with other social media management tools, check out my article on the Hidden Prices of Social Media Management Tools. I was under the impression that extra team users (on the pro account) cost $9.99 per month but on close examination but it's not quite as simple as that. You get 2 user free per month on the Pro account (and one of these users is you). The 3rd user costs $9.99 per month, and then each one up to 10 users is $14.99 per month. 10 users is going to cost $1,800 per year. Update (September 2015). It seems Hootsuite have finally made the prices for each extra team member a little more simple to follow. In the pro plan you have yourself and one team member included for $119.88 per year (equivalent to $9.99 per month) or $14.99 per month (if paying monthly). Each subsequent team member costs an extra $119.88 per year or $14.99 per month extra. You can have up to 10 team members including yourself. If you want 11 users, you're going to have to sign up for Hootsuite Enterprise. As for the price of the Enterprise plan, I could tell you, but I'd have to kill you. Actually, seriously, there is a lot of secrecy about the Enterprise plan. I've tried to find out over the past few years but no one is willing to tell. Over 4 years ago the price that was circulating the interwebs was an eye-watering $18,000 per year. As for what it is these days, it will vary depending on your needs. It's likely to be a different pricing structure depending on whether you are an agency or a company. Here is a table that summaries the user cost (since it's far from obvious from Hootsuite). In 2013 Hootsuite started offering a discount if you pay yearly and offered prices in different currencies, so if you are outside the US you may be offered prices in your currency. This likely to be more expensive. 11+ The maximum number of users in Hoostuite Pro is 10, to add more users you will need a Hootsuite Enterprise account. Hootsuite now offer prices in a few other currencies . If you live in the UK for example you have to pay in pounds (since 8th March, 2013). This is determined by your IP address. Unfortunately the prices are quite a bit more expensive in other currencies. Hootsuite have listened and reduced the cost. In the UK the base price per month is £6.99 (if you pay yearly) or £9.99 per month (if you pay monthly). This is still a bit more expensive than the equivalent price in dollars, but certainly more reasonable. You could try and dodge this by connecting to a VPN to get a United States IPN, delete your cookies and visit the sign up page, but that is trying to trick Hootsuite into thinking you are from the US which may be morally grey. If the above reasons don't put you off, then Hootsuite may well be the best solution for you. Check out the alternatives below as well as test out Hootsuite. They offer a free plan and a 30-day free trial. There are plenty of other tools out there that offer similar services to Hootsuite. Have a look at some of the comments below and let me know if you know of ones that you’ve personally used and would recommend. In particular, I recommend reading another article I've written on my recommended social media tools for small businesses. 7 Reasons NOT to use Sprout Social! I’ve written a follow up to this article, based on Sprout Social entitled 7 Reasons NOT to use Sprout Social. So there you go, 7 valid reasons not to use Hootsuite. Of course, you may well feel these aren't strong enough reasons, but they are annoyances that I have found with it. Despite all this, I would still recommend Hootsuite to businesses in many situations. If they have the resources to pay for the extra features and especially if they want to use it for customer service. What do you think? Please do add your comments below. If a link has an asterisk by it, it means it is an affiliate link and generates a little income for the site. If you end up signing up for the service and paying it may result in a small proportion going towards the upkeep of this site. You shouldn't notice any difference in the sign up process. The editorial line is NEVER impacted by these links. I will only ever recommend a product or service if I think it is worth recommending! If a product or service does not have an affiliate scheme, then we will still include it in the same way. Ian is the founder of the Confident Live Marketing Academy and helps entrepreneurs to level up their impact, authority and profits by using live video confidently. Seriously Social is a blog focussed on live video and social media tools. He’s an international speaker, trainer, teacher and consultant. © 2012-2019 Seriously Social with Ian Anderson Gray. All Rights Reserved.